I’ve always been meticulous about tracking my spending. Without tracking your spending, you will have no idea where your money is going. While trimming my budget this month, I noticed a glaring fact: I’ve budgeted $56 a month for haircuts over the last 2 years. Let me say that again: I’ve paid $56 a month for haircuts. Consistently. For 2 years. In Thomas J. Stanley’s book Stop Acting Rich, I learned that real millionaires paid about $16 (tip included) for a haircut at a traditional barbershop – no appointments taken, no coloring provided. I love getting haircuts. Who doesn’t love the fresh and clean look a new haircut provides? For the last 2 years, I’ve been going to the same barbershop and going to the same barber (majority of the time). He always cuts my hair just right and I like the consistency. I found my barber before I moved from Los Angeles to Orange County, and I have always refused to look for a new barber since he always cut my hair superbly. This barbershop is 33 miles away from our home. I decided a while back (after waiting 2 hours for a haircut) that if I was going to drive up to 50 minutes in traffic just to get a haircut, I better make an appointment so that I didn’t have to spend more time sitting around the shop for my turn. Appointments are more expensive. To top it off, this establishment is cash only, so I don’t even get credit card rewards points. Then I figured that if I was going to drive this far for a haircut, my wife and I might as well carpool together and also eat at a local restaurant afterwards to make the most of our time in the area. Next thing you know, I was spending $28 for the haircut, $30 for dinner, racking 66 miles onto my vehicle’s odometer, and paying $11 for gas and vehicle depreciation on my ~23mpg vehicle that requires premium gasoline. I used Gasbuddy’s Trip Calculator to determine the trip cost. AND, I was doing all this twice a month. Total costs: ~$140 a month [($28+$30+$11) x 2]. If I were to continue this habit, $140 a month compounded over 10 years would come out to be $24,231. It’s funny how we can get stuck in certain habits and not even realize how bad they are for us. This past week my hair was getting a bit long. After taking a hard look at the numbers, I wasn’t too excited to get a haircut anymore. I wasn’t excited about driving 66 miles round trip, potentially in traffic, and then forking over $28 in cash for a haircut that takes only 20 minutes to finish. I wasn’t excited about trying to enjoy dinner while little prickly hairs down my undershirt were tickling my neck and itching my skin. I also didn’t look forward to getting home late after the whole ordeal, and then having to shower at home to get the little hair trimmings off my head, neck, and skin. It annoyed me that I had already put in around $1,344 in haircuts ($56 x 24 months) just over the last two years! And this isn’t counting the years worth of haircuts prior to this time. If I conservatively count my prior haircut expense at $15 a cut ($30 a month), I probably have spent over $5,000 over the last 15 years. Has this $6,344, 17-year investment in my hair paid off? Hell no! The hair just grows back after a few days. If I average the cost of my haircuts per month at ~$33, then compound it at 7% over 17 years (the amount of years I was paying for my own haircut), I could have had $12,874 in my investment account today. This doesn’t count the amount of money my parents spent getting my haircut before high school (when I got my first money paying job). Armed with the fact that I’ve blown way too much money on haircuts over my lifetime, I’ve decided to stop paying for haircuts. I did a quick search online and picked up the number 1 most highly rated hair clipper on Amazon here. For $21.97 and free shipping (if spending over $25), I figured this was worth giving a try. The wife and I did then some Google research on “how to cut your own hair” and then looked on youtube for some videos on “how to cut a fade.” After 15 minutes of research and preparation, we decided to give it a whirl. I told my wife that if we messed up, she could just shave my head. Hair grows back (unless you're bald, which I'm not yet). We nervously took it very slow, starting off with a higher clip number (6.5) and then slowly working down the attachment clips slowly in half steps. At some points we switched off where I cut the sides of my hair myself, and my wife cut the back. 2 hours later, I’m happy to report that the haircut turned out just fine. 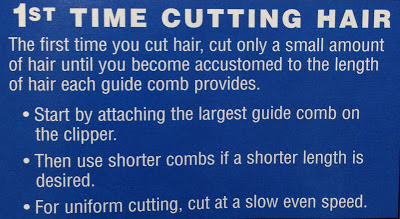 I’m sure we will continue to get better and more efficient with each new cut. Now I can pretty much have my hair cut whenever I want, whether it’s every week or every two weeks. Clean up was quick, and I didn’t have to worry about those pesky little prickly hairs irritating my neck – I just hopped into the shower next door. I am a bit surprised at how long it took me to just try to cut my own hair. This little change will help us save over $600, 1,584 miles, and countless unproductive hours each year. For many of you who already cut your own hair: I salute and respect the decision you’ve made; keep it up! 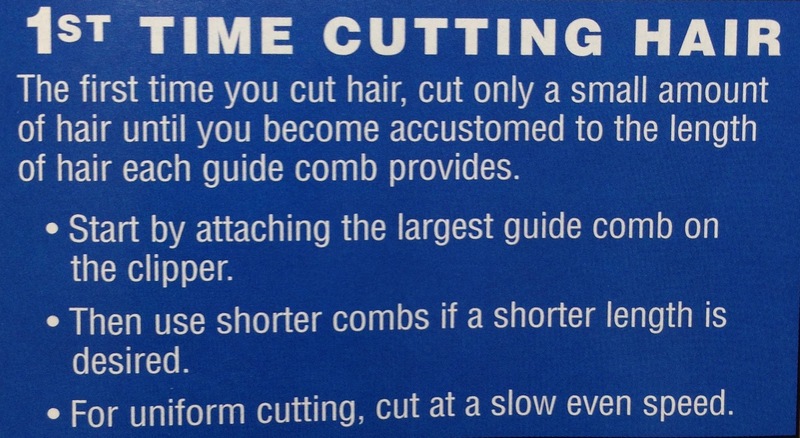 For those who have never ever considered cutting your own hair: give it a try. You might be surprised to find that it really isn’t that hard to do, and the time and money savings are substantial. EDIT: Don't get me wrong, I'm not bashing my previous barbershop. I still believe it's the best in the area. I simply made a conscious decision to start having my hair cut at home. EDIT: Omitted name of barbershop and some identifying factors.